Dog behavior modification is a way of correcting annoying or unhealthy dog habits and replacing them with good dog behavior. In short, it is simply teaching your dog to behave in a manner different from the behavior that you want to correct. 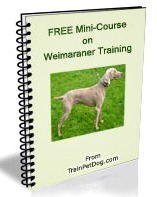 Weimaraner training and behavior modification, must begin early, to make sure that undesirable behaviors do not develop and become ingrained. It is important to be firm, but loving with your dog. Weimaraners do want to please you! Because of their size, Weimaraners can get in the way, trip a person or knock a toddler down. A dog that gets in your way, must be trained through repetition, to go to a specific location, such as a dog bed or mat. One of the most important things to enforce in this breed is that the house is your territory. When you enter your home, your dog should wait patiently behind you, until you give the signal to enter. 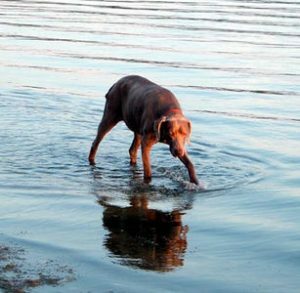 Dogs understand that this is a way of establishing who is in charge–you or your Weimaraner. Did you know that some dog traits are actually inherited? 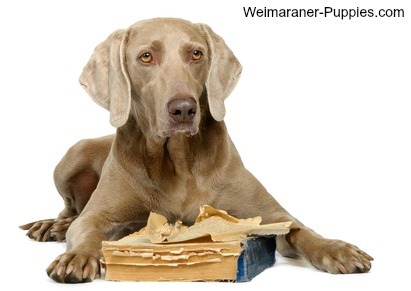 That’s why it is so important to know your Weimaraner puppy’s background. In addition to any medical conditions that your puppy’s ancestors may have had, were there any temperament problems or behavior issues? How did your dog’s parents do while hunting? Knowing what your puppy’s parents and grandparents were like, is often an indication of what your grown-up Weimaraner will be like. While most canine behavior problems can be corrected by dog behavior modification, some dog traits are difficult to change. If your Weimaraner hunts with you, or you are planning to get a Weimaraner puppy who will hunt with you, it is important to know which characteristics can be inherited. Love of the water is a hunting trait that is inherited. This doesn’t mean that your dog will not respond to training if she has the wrong genes. It just means that getting a dog with the right genes, will be a lot easier to train. These hunting dog behaviors are considered to be dominant. That means that if one parent has one of these characteristics, the puppies should have it too. Outdoors (i.e. when hunting together) you need to trust that your Weimaraner will move in the right direction, at the right time. When you are hunting, your dog’s obedience is literally a matter of life and death. When you establish that you are the Pack leader, your dog will adore you and want to do whatever you ask him to do! Hopefully you will have no dog behavior problems or issues with your Weimaraner. However, it is possible that your Weim will have a behavior issue or two. Fortunately you can even correct your dog’s behavior if she is older. The old saying that “You can’t teach an old dog new tricks.” is not true. Even an old dog can learn new behaviors if you know how to approach her. The following video shows how Doggie Dan handles dog aggression toward other dogs. You can access over 100 of his dog training videos for just $1, here. I love Doggy Dan’s video training series. He has a gentle manner, yet gets the dogs to want to obey him (and their owners). You can access over 100 Doggy Dan videos for just $1, here. While it is important to address your dog’s poor behavior while he is still young, you can correct bad behaviors anytime, if you know how to do it.